Home » risk » Nasal Hair Protective Against Asthma in Patients with Allergies? 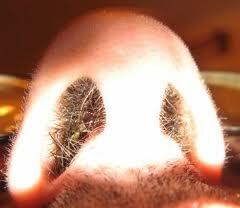 Nasal Hair Protective Against Asthma in Patients with Allergies? Researchers in Turkey found that there is an association between nasal hair density and risk of asthma developing in patients with seasonal rhinitis patients. No joke... They published their findings in the International Archives of Allergy and Immunology in March 2011. The rate of asthma found in patients with little or no nasal hair was 44.7% whereas only 16.7% of patients with a dense forest of nasal hair had asthma. They hypothesize that increased nasal hair improves allergen filtration thereby preventing the allergens from irritating the airway. The assumption here being that allergen irritation of the airway can potentially cause asthma. IF this is true (and that's a big if)... patients with allergies should be encouraged to grow nice thick nasal hair to prevent future asthma! Read the research abstract here!